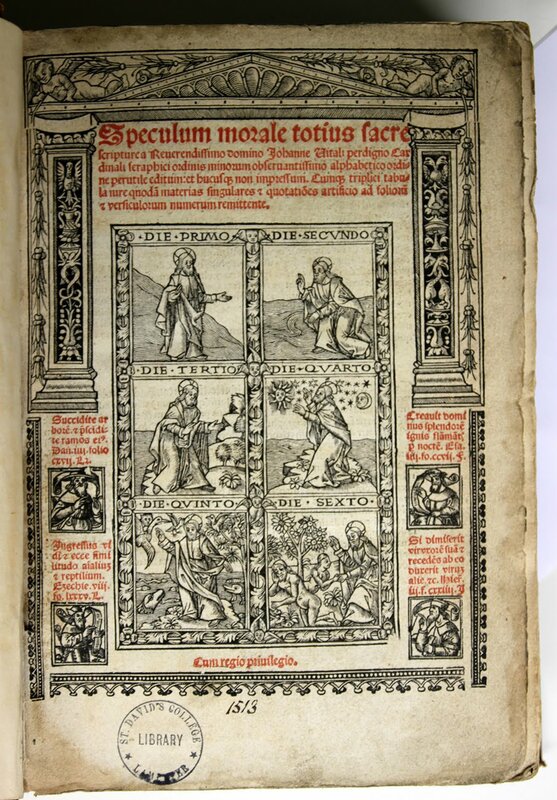 This is a French printing of Vital de Four’s Speculum Moralae, printed in Lyon in 1513. It is a deeply frustrating book on one level, as it has been rebound at some point in the middle of the twentieth century in a plain, panelled Calf binding. 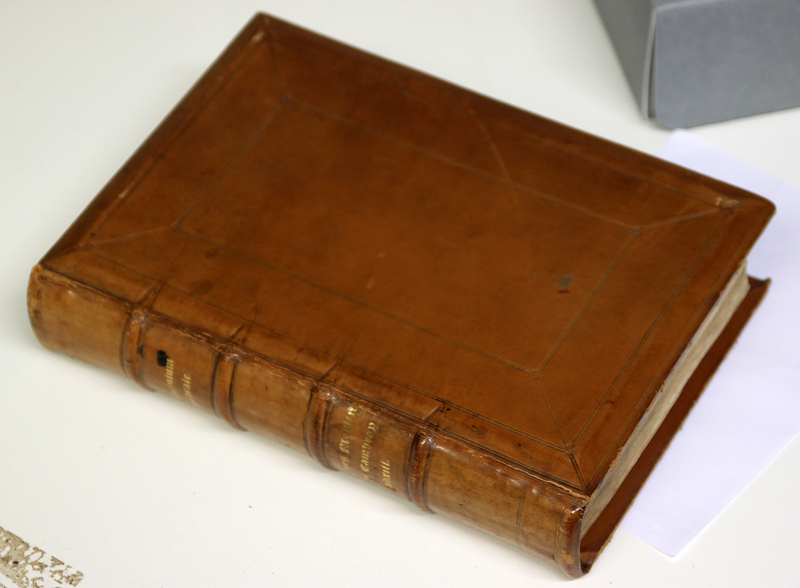 Of course until relatively recently this sort of wholesale rebinding was undertaken as a matter of course on antiquarian books in poor repair, the condition of the text of the book taking precedence over the evidential and aesthetic qualities of the binding. All evidence or record of the former binding has now been lost, except for the vellum pastedowns, which have been retained and have been bound into the rear of the book. Thank goodness the modern binder had the foresight to keep these pastedowns as they are interesting and rather special. 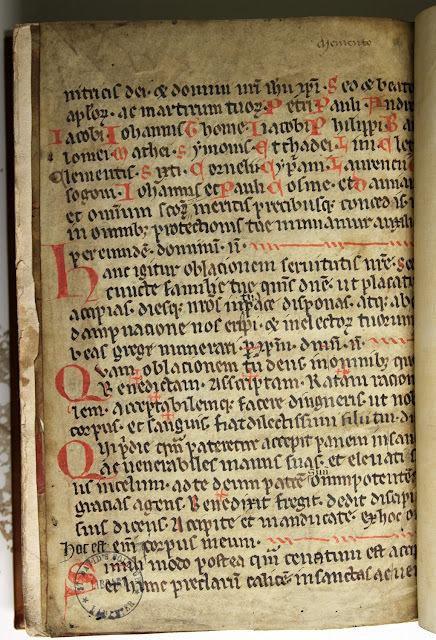 The two leaves formerly pasted into the front and back cover of the earlier binding, consist of a substantial and sequential gathering from a quarto sized medieval manuscript Missal. The element of the Missal preserved here as 'binders waste' in the book's former binding, is the text of the Canon of the Mass. 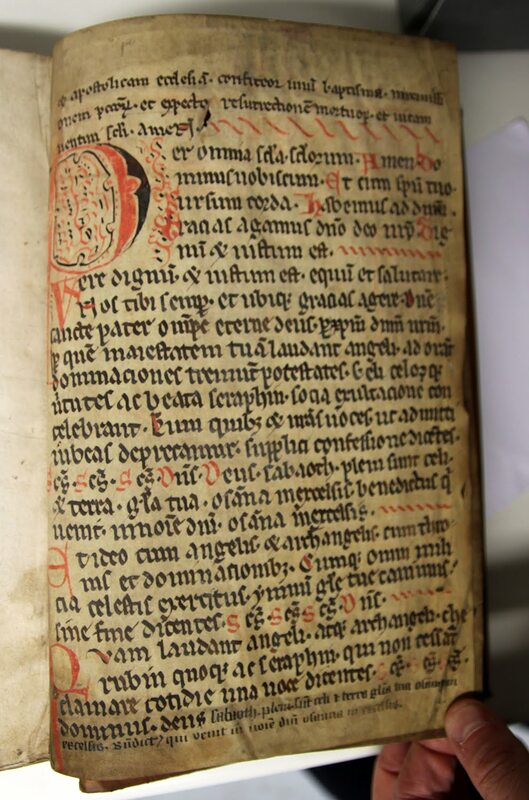 With respect to date and provenance we have little to go on, the script appears to be fourteenth century and may well be English. 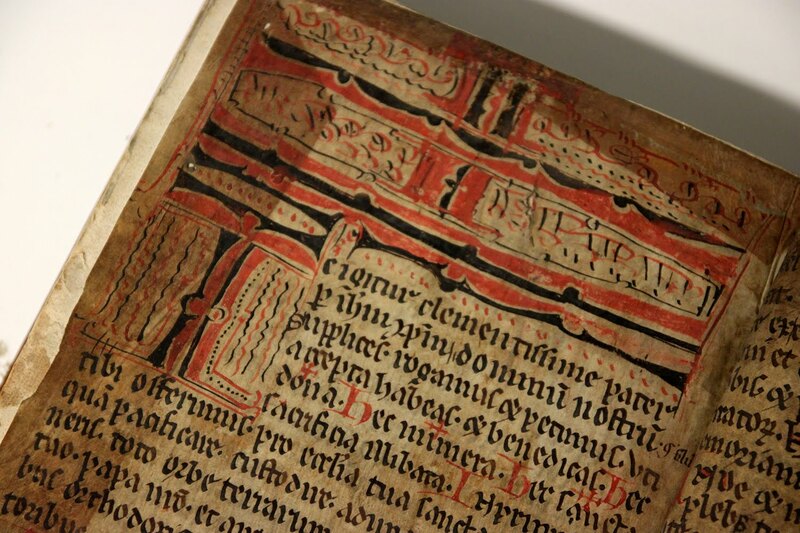 The manuscript pages of this lost Missal, are not of high quality and do not represent the pinnacle of manuscript production in this period and as such they are rare. The text is rather workaday and inelegant and the decoration is rough and ready. There is a feeling that the scribe is copying the text with little real sense of how the finished work will work aesthetically on the page. 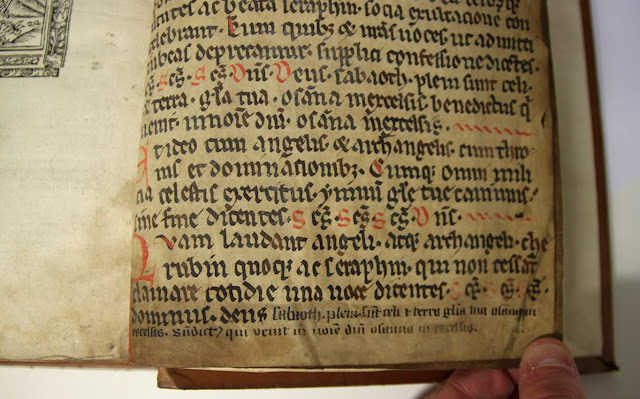 At one point (during the Sanctus) the scribe clearly runs out of space and shrinks the size of his text, rather than run it over the page onto the next side. That to me suggests that the scribe was a priest and that he his primary concern was the flow of the liturgy, rather than design elegance. Running out of space for the Sanctus, the size of the lettering changes. The crosses that mark the points in the mass where the priest makes the sign of the cross with his hand over the oblations, have clearly been added in as an afterthought, once the text has been completed. They are squeezed in, above and in some places over the text. 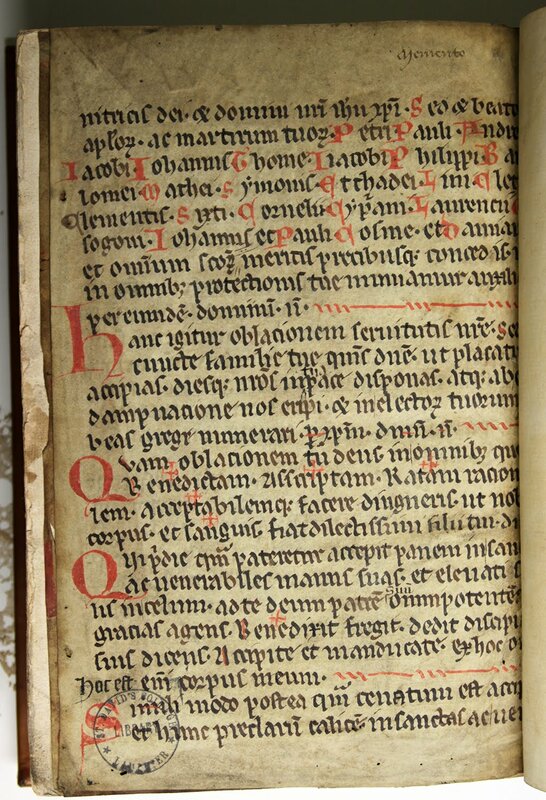 This sort of workaday, rough and presumably cheap manuscript Missal was almost certainly commonplace in the late Middle Ages, it may well have been the most common sort of Missal. We know that priests often copied Missals themselves, rather than buying one from a scribe. There would have been thousands upon thousands of such liturgical manuscripts in use in England by the beginning of the sixteenth century. Such manuscript missals are extremely rare, primarily because there were two forces at work in the late fifteenth and early sixteenth century that ensured that this quality of book became obsolete. 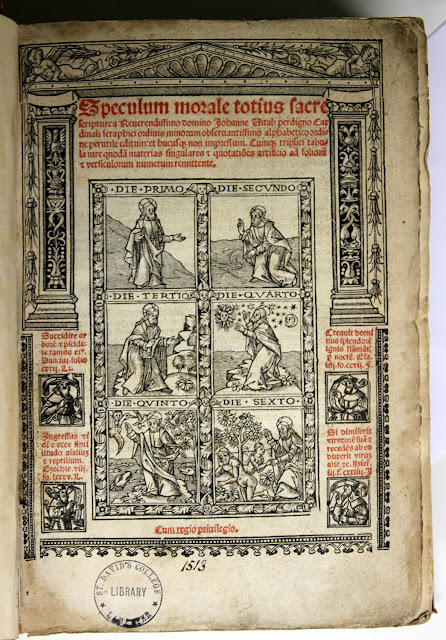 Firstly the invention of the printing press flooded the market with cheaply produced liturgical books and the more rough and ready liturgical books were supplanted by more accurate printed text. With the Reformation in England and the shift to the Book of Common Prayer, missals, both printed and manuscript, lost their purpose entirely. Having little aesthetic and therefore commercial and collectable value, books such as this ended up being discarded or sold on the open market. On the open market they were simply recycled by craftsman, including binders, as cheap scrap material. Manuscript waste such as this continued to be used with frequency as pastedowns and spine strengtheners in bindings well into the early seventeenth century. The shadow of the original leather turn-ins of the earlier binding. 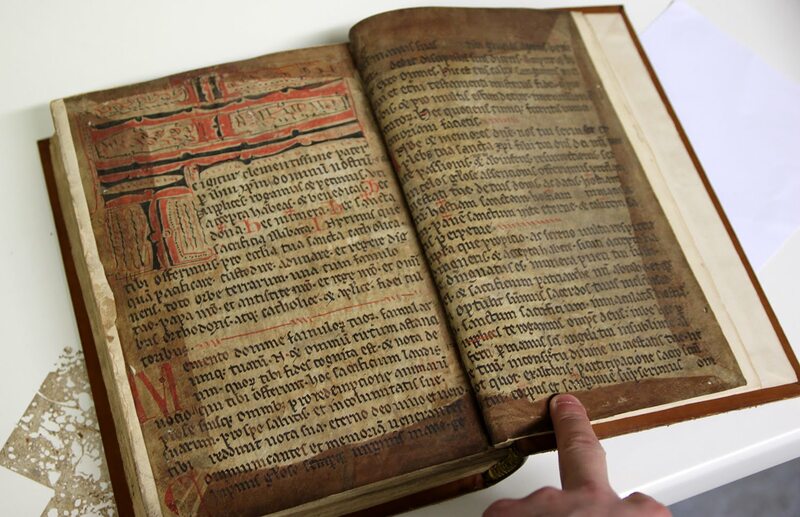 The action of pasting down these manuscript leaves onto the boards of the Speculum's earlier binding has left a shadowy imprint of the leather turn-ins of that binding, a tantalising hint of what has been lost. The use of this manuscript material suggests that this binding was perhaps mid sixteenth century and English, though we will never quite know. Lampeter, University of Wales Trinity St David, ODS. 00446 – Speculum moral[a]e totius sacr[a]e Scriptur[a]e / Reuerendissimo Johann. Vitali per digno cardinali seraphici Ordinis Minorum Obseruantissimo alphabetico ordine perutile editum, et bucusq[ue] non impressum ; cumq[ue] triplici tibula iure quoda[m] materias singulares [et] quotatio[n]es artificio ad folioru[m] [et] versiculorum numerum remittente – Lyon, John Moylin, 1513.